Over the years, there have been a lot of rhythm music games franchises to come out that range from Guitar Hero to Rock Band and Rocksmith. Out of that crowded field, Tak Fujii (of Ninety-Nine Nights II fame) seeks to revolutionize the genre with his upcoming localization of Gal Metal for the Nintendo Switch by XSEED. Gal Metal is a game where you balance the social life aspect of being part of and managing a high school metal band with defeating aliens who want to take revenge of Earth for the metal music stored on the golden Voyager record. In other words, there’s a lot going on, and unlike pretty much any other music game out there, you have to set the timing and rhythm as you rock the night away with the Joy-Con. During E3 2018, I caught up with Tak Fujii and talked with him about the concept of the game, telling the story through manga panels, and fathering a son who is coming into his own musical talents. You can check out Gal Metal on its website. You can also follow XSEED on Twitter, like them Facebook, subscribe to them on Twitch and YouTube, and reblog them on Tumblr. You can follow Tak Fujii on Twitter and visit DMM.com Group at their official website. You can also check out our hands-on impression of Gal Metal from E3 here. Gal Metal is available now for preorder and is set to release on October 23, 2018. Tak Fujii: Fujii, the producer of Gal Metal. Thanks for coming. OR: Thank you. Just to start off- what is Gal Metal for those of us who are out there who haven’t heard of it before? TF: It’s a brand new rhythm game for which there are no arrows falling from top to [bottom]. It’s iconic and a new thing. OR: That is something that I noted- in most music games like Guitar Hero or Rock Band, you have markers appear on screen telling you what to hit and when to hit it. It’s time based. Yet Gal Metal doesn’t have that. You actually said on Twitter “The game is about how you build your own rhythm, not so much to trace great compositions.” Why did you go away from the industry norm to make Gal Metal? TF: Because in the game industry, we are looking for something -and the player is always looking for- something new. And we, as a Japanese developer, [are] always keen about ‘what’s new? What’s the new product? What is important for everyone?’ The music game format -if I’m correct- is born from the ‘big name’ years and its been around for about twenty years already. So why not have a new format, since new consoles are coming out and new games are coming out, [and] what we see is the same format which has been embedded in that twenty years. OR: On a practical note- how hard is it to innovate in this way for Gal Metal? TF: It was really hard. It’s been hard. The studio has experience to make a music game already, so I’m sure they can make traditional music games. So it was a bottom line for me to develop that game- ‘Okay, the team- you guys can make those music games. Let’s try something new.’ And then my idea is to build the rhythm. Like you make the music through the game. That’s the main cause. So the first cause was to just get rid of all of the arrows first and see what happens. But it is too hard for the non-music experienced player and non-drummer. For me, it is easy. Composing music and building a rhythm part is easy. But for most game players, it was rather hard. So we really struggled with what is the best way to guide for non-musical experience background players to have fun, to play the drums in a freestyle that [let’s them] develop their own rhythm. To show your friend ‘hey, this is my drum pattern, what’s yours?’. So we tried twenty or thirty prototypes to make it happen, and still we don’t think it’s a perfect form yet, but it’s a beginning- it’s a new start for a new era of music games. You play the role of a drummer in a high school metal band in Gal Metal. (Images courtesy XSEED). OR: The song demo we played out there was in a 4/4 time signature. The other pieces in the demo are in a 4/4 time signature as well. Why did you choose that one to play the drums in? TK: It’s pretty much a basic format with four beats. Everyone knows the four beats: One-and-two-and-three-and-four. In maybe the middle of the [game], level four or five or six, we do have some different beats like a 7/4 and 6/8. So it’s too hard for non-music experienced people. So we just start with one-two-three-four, two-two-three-four. So from that easy, simple rhythm, you can do a lot of things from those four beats. As you make your own rhythm in Gal Metal, your score goes up in the top left corner. (Image courtesy XSEED). OR: Are you developing [Gal Metal] for people with no musical experience, with a little bit, advanced players, or are you targeting all three? TF: All the way from the beginning to the [experienced]. So it has a very wide range in my world. May I show you? I don’t know how experienced you are with the game. TF: So this is all the way from the beginners to the advanced players, and it is unlimited as much as you want. OR: Diving into the storyline a little bit, this is a gender-swapping storyline of a boy going into a girl’s body and developing a social life while balancing social politics and text messages with managing a band- and there are aliens seeking revenge on the Earth for metal music stored on the Voyager golden record. Where did this plotline come from? TF: I’m a producer, so I’m not the one responsible. I mean, I made the story outline, but the first concept of this game is about the schoolgirl band with heavy metal. Period. The middle is about the death and the evil black magic or something. And having the schoolgirls is a balance. And so I was really interested in having those combinations. And so I told the director: ‘Hey, here is the theme. So we should come up with some script.’ And he went ‘Okay, no problem.’ And he sent me the first [draft] to bring the girls to the metal with the alien octopus from somewhere in the galaxy. And I say ‘Hey, are you sure this is right?’ And he said ‘Hey, why not? It’s a sci-fi.’ So pretty much all the school stuff is set in sci-fi. Just using the power of the metal. And he’s a really famous script writer and director of the game named Shuho Imai. And I trust him, because he’s a professional. OR: So you turned the story duties over to him. Did you pick the music tracks in [Gal Metal] or did somebody else choose them? TF: Original scores – a couple of them I chose and picked them out and said “Hey, use them.” But many of them [were] picked out by the director who is the script writer, [and] they match each episode. Like this is Antonín Dvorák’s New World Symphony and [it takes place] in the first episode, which is a new world of gaming. And the songs will be following each chapter of the theme. OR: Each chapter is told through manga panels. Why was that particular medium chosen to tell a story through, instead of through cutscenes or like a visual novel method? Why dynamic manga? TF: Because this is the most impossible explanation of a story-telling for a player, I believe. Do you read all the text? This tale of a protagonist who body-swaps with a girl, joins a metal band, and fights of aliens who want revenge on the Earth is told through manga panels. (Images courtesy XSEED). OR: Yes, I do read all the text. I do play visual novels, I read all the text. TF: Really? Oh my. You are the niche player. I’ve been working in the game industry, and so many games have a big text box at the bottom and the character does all the movement and all the player does is press the ‘A’ button [and says] ‘Just gimme the game, just gimme the game.’ And even the nice triple-A movie sequel games- ‘Just gimme a gun to shoot them all.’ But in the manga, it’s akin to reading and they are happy to read it. Especially in Japan when on the trains they hold a smartphone and read a manga. 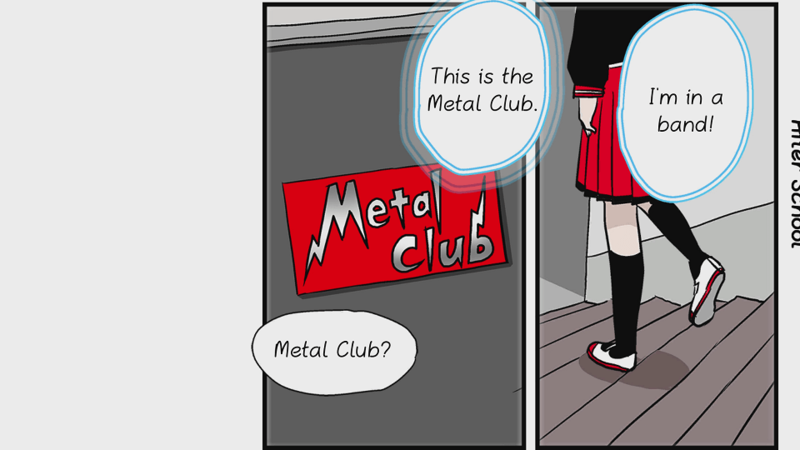 So the manga is the best way show the girls’ school life and the storyline and what Gal Metal is about. So no one gets confused why these girls are fighting these octopus[es]. ‘Cause if you don’t read it, there’s no sense to find out why there is metal, why is there [a] crazy octopus, right? OR: Were there any particular challenges with developing your storyline for a manga medium? TF: Moving all of the sprites, dynamically, that was quite a challenge. It’s sounds like ‘old school’ and sounds like it was the cheapest way to show the story in the game, but it’s not. It’s required tons of adjustment, tons of movement, because the original manga is not moving. The manga art is made by [a] real manga artist, Mr. Toshinao Aoki. He’s a quite famous manga artist in Japanese manga culture. He has no idea how to move those characters dynamically, so he just [made] a [large-sized] manga. And we had to try to figure out ‘what is the best movement of each character?’. So we had to take all of the character’s layers out and adjust them [by] shrinking. It is a tough part. You might not recognize how hard it [was]. OR: So you did almost a full manga for the storyline, and then developed the game off of that? 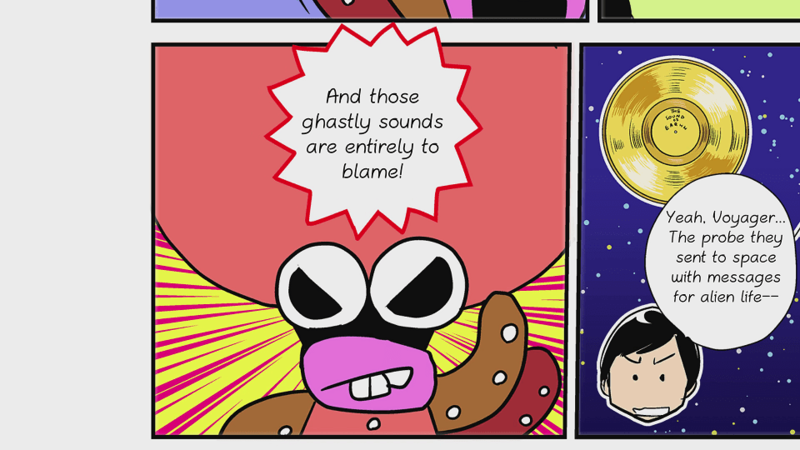 The only way to stop these octopus aliens is with…metal music! (Images courtesy XSEED). OR: [Gal Metal] is pretty different than things you’ve done in the past like Ninety-Nine Knights II and Frogger 3D. Why did you choose to do something in the social sim rhythm genre? What was the impetus for ‘this is what I need to do’? TF: As you mentioned my previous titles, I have been working with Konami for about twenty years. And I got there by being [their] sound designer/sound composer. So I got there by a music background. And I have seen where the Beatmania was born, I haven’t seen where the DDR started. But personally, I wanted to make a music game. Since [Konami has] big [music] franchises already, there’s no chance to make [a music game] as much for them. So I was always looking for a chance to make a new music game. And here’s a chance, so I had a chance to make a new one. OR: Are there any songs you wished you could have put in that you weren’t able to? Instead of making them fully original music- its really hard to understand because [the player] to learn the music first, right? But instead, we pick up all of the classical things. So you know what is the song beats, you know how the melody goes and falls. And so, we had a brief idea ‘Okay, how are we going to include drums? What is the peak? What is the ending?’ So it is easier to start and easier to learn. And of course, those pieces are about four-hundred years old [so] it must be a great piece. And all of the younger generation who really doesn’t listen to classical music, it is a chance to learn about the great composers throughout history. The music in Gal Metal are all classical pieces, so you can decide how the drums should sound. (Images courtesy XSEED). OR: You mentioned that you have an interest in classical music. What composers do you like and why? TF: Beethoven. Because he is punk. Back to the 17th century, all of the other composers [were] nice [and] formal. But he was punk at that moment, and he had a big C-minor chord: DUM-DUM-DUM-DUMMMM-DUM-DUM-DUM-DUMMMMM. [OR Note: This is a reference to the first four measures of Beethoven’s Symphony No. 5, composed between 1804-08.] Its very simple but very passionate [with] so many [of his] arrangements. And of course, he has a sad story in his life. And his music has always motivated his mind and his passions. He is the one I very greatly respect and love to play on the piano. OR: Recently on Twitter, you mentioned that you went to a guitar museum. Do you play any instruments? TF: Yeah, the guitar and bass and drums. And I am pretty much good on the piano. TF: I used to compose, because I was hired at Konami as the music composer. OR: What influenced your compositions? TF: Well, it’s my personal motivation, what I feel. I feel good, I feel bad, I feel sad. Those have feeling, and there might be some reoccurance from year to year. I was composing in the 80s and 90s. OR: Have you thought about working with Nintendo to make a Labo set for [Gal Metal]? TF: This is a drum kit and holding a Joy-Con in [each] hand, and making a kick drum with your right hand. Because we are supposed to follow the regulation which Nintendo has given that having a drum to not swing too much because it’s going to go [flying]. So originally, we had the idea to put the Joy-Con on our shoes to make the kick drum. It was found that we weren’t supposed to do that, because Nintendo might hate it. But to just show you the Labo drum kit- hey, that’s not fair! It’s possible to have a drum kit with the cardboard, it could be fun. OR: There is a story told through thirteen tracks in [Gal Metal]. Have you thought any about expanding it with DLC? TF: There is DLC already, and [it is] out on the Japanese e-Shop already. So there are eighteen episodes already. And if people love my game, we will absolutely think about additional episodes. OR: So I was playing the demo [at E3 2018], and I noticed that you can actually save the videos. Is there any way to share them online? TF: If you save the video and record it on the smart phone, you’re welcome to share it on Twitter, Facebook, YouTube – anywhere. OR: But it won’t be native through the game? OR: What are you currently listening to? 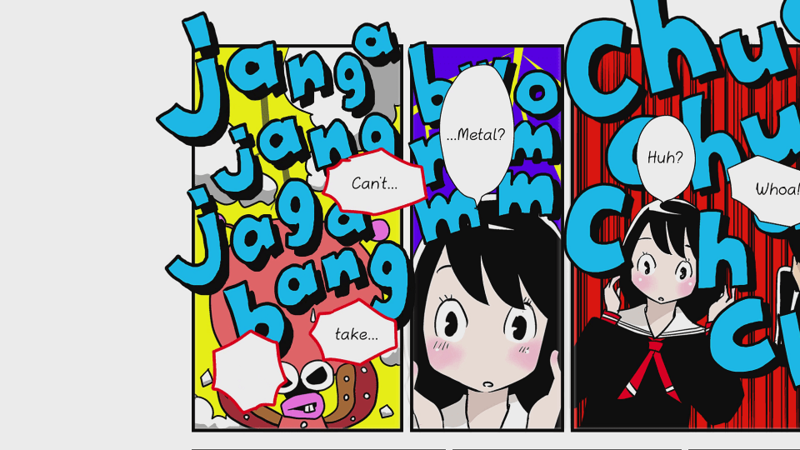 TF: Gal Metal. But recently, I’ve been listening to some domestic Japanese artists, ‘cause my kid is now seventeen years-old and he is ‘roooock’. And I’m just teaching him how to play the guitar and drums. And go ‘this is a piece dad likes’ and he goes ‘hey, this a recent one, why don’t you take a look?’ So I keep updating my music. So there’s no specific band I can speak [of]. OR: So you’re raising a seventeen year-old musician as well? TF: Of course, he’s really good at it. Gal Metal unfortunately does not have a Labo kit, but you can simulate a drum set with the Joy-Con. (Image courtesy XSEED). OR: How is it instructing [him] about [music]? TF: I don’t know. I show [him] how fun it is. But my son is watching me playing guitar and singing in the bathroom and he is going to pick it up for fun. 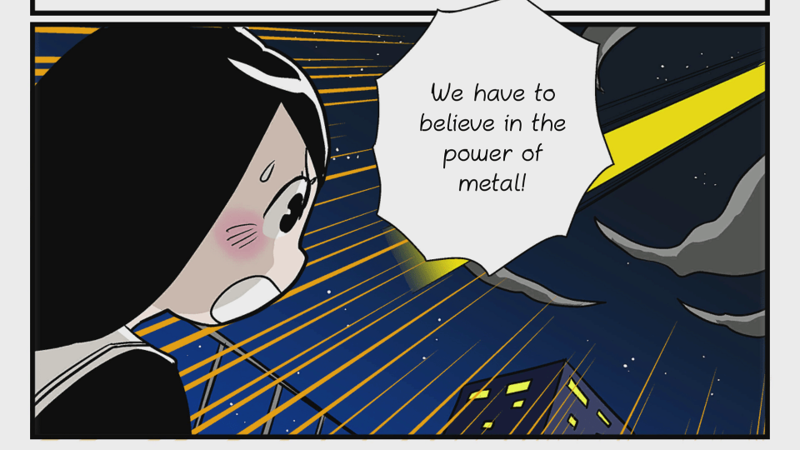 The fun of being in a band, and talking with the band, and having communication with the band- the whole story [in Gal Metal] is about the band. Not just battling octopus[es], but the days [at] the school. ‘Would you like to go to the café in the afternoon? What movie did you see?’ In a band, its very important- more than the music, the feeling of the band is the key to making the music [and] the band. So not only showing the music but the band culture/life is another goal of my game. OR: Did you play in a band? TF: Oh, of course! I’m from the eighties and nineties. It’s a band era. OR: Do you still play in one today? TF: Not really, because I’m getting older. Everyone always seems busy. OR: Music has transitioned from having an audience watching to having cell phones watching. Based upon your experience, does it seem like you’re playing to the camera or the people still? Those social media and smartphones are great for expanding your music, but the key is you and your friends being there, singing together loud and shouting music. And then go back home and with that memory, you will be making your friendship with your buddy: ‘Hey, we’ve been there.’ That feeling is very important. That feeling is not going to be missing, even with a smartphone or video live. This is important. Because Metal is music, and music is life. (Image courtesy XSEED). 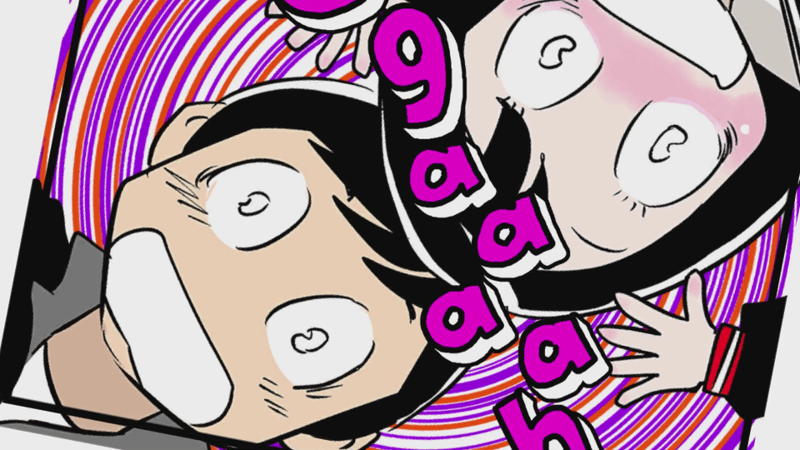 OR: Last question- to someone who may not have heard of Gal Metal until this E3, what do you have to say to them? TF: Pick it up and play it with your friends. Don’t play it alone. Have fun with your friends. Have fun with your band, your mates, and you won’t forget the fun moments you’ve had for your life. Gal Metal is available now for preorder and is set to release on October 23, 2018. What do you think of Tak Fujii’s new take on the music genre? Are you planning on picking up Gal Metal at launch?